Senior Marissa Lynch plays in one of the first preseason games of her senior season against Estancia high school. Despite the many ups and downs throughout her soccer journey, Fountain Valley High School (FVHS) senior Marissa Lynch continues to work hard and fight through roadblocks. Her success is a result of her strong will to overcome numerous health conditions including a rare heart condition, severe concussion and a sinus infection. Lynch is one of three captains for the varsity soccer team for the ‘17-’18 season. She plays every game and is one of the top goal scorers on the team. 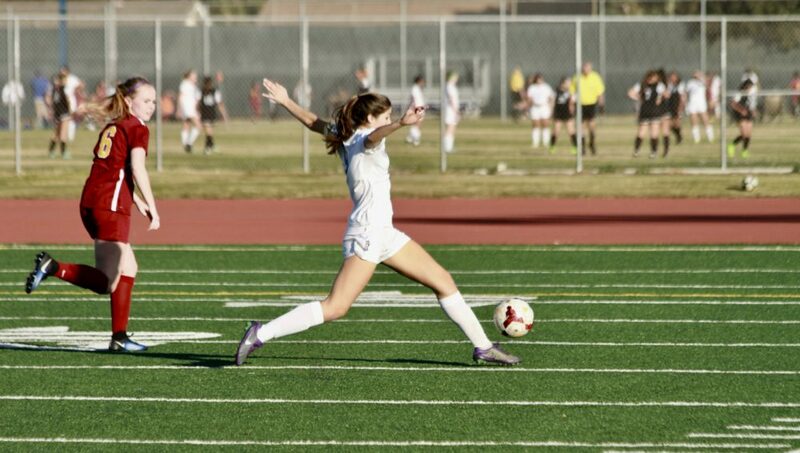 Many colleges have considered her to play, but she ultimately chose to attend University of California San Diego to continue her soccer career. She has also retained her high grades and finished her first semester of senior year with a 4.13 cumulative GPA. At 13 years old, she was called up to the U-14 U.S. national team, a prestigious team that consisted of 36 girls chosen from the entire country. During this time, she trained with the team for a year and played in three games, while also being scouted by the coaches for the U-17 U.S. national team. Lynch’s first obstacle arose during her time on the U.S. national team when she discovered she had Wolff Parkinson White, a rare heart condition. Though her condition was not serious, Lynch was unable to play for the U-17 national team because of a heart monitor she had to wear constantly. After being cleared to play again, Lynch returned to her club team and strived to get back on top. She made the FVHS varsity soccer team her freshman year and was ready to prove herself to her coaches and teammates. However, early in her freshman year on her club soccer team, she suffered a serious concussion during a game that caused her to miss over 50 days of school. After her long absence, she could only take two classes during her first semester because of her inability to maintain focus without getting headaches. During her second semester, she had to make up work from the first semester while simultaneously completing her current classes. Despite this difficult time, Lynch studied hard and maintained a 3.7 GPA her freshman year. Lynch decided to dedicate her sophomore year into getting back on track with her academics. Even after her concussion and a critical sinus infection that required surgery, she continued to work extremely hard in the classroom and achieved a 4.2 GPA. After two years of recovery from soccer, Lynch finally returned to play for the varsity team. During this season, she trained hard to get back into playing full games like she could before the concussion. “Junior year was a recovery year getting back from my concussion. For me, it was a personal thing. I wanted to prove that I could get back into soccer shape and be the player I was supposed to be before the concussion,” said Lynch. Though Lynch’s journey has been difficult, she has remained strong and determined to get to where she is today. “I am proud of myself for figuring out my life and being able to handle everything. I wasn’t sure everything was going to work out, but I’m super happy it did and that all my hard work paid off,” said Lynch.